Back by popular demand, the MC75 mono vacuum tube power amplifier delivers modern performance standards in a classic design. It has all the features to meet the needs of today’s music enthusiast. As with all McIntosh mono amplifiers, the MC75 will provide ultimate stereo separation and imaging as the two stereo channels are completely separate. 75 Watts of power is output into a 2, 4 or 8 Ohm speaker with less than 0.5% distortion. 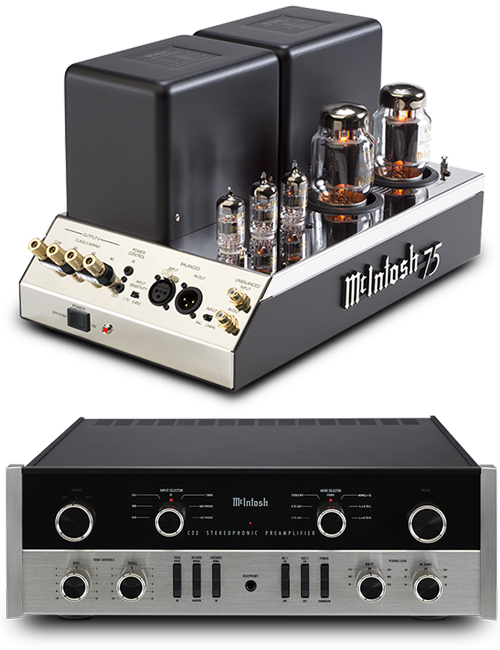 McIntosh’s patented Unity Coupled Circuit design provides low distortion, extended frequency response and long tube life. The MC75’s large, oversize power transformer provides unusually high power and dynamic response from a single pair of KT88 output tubes, once again setting the performance benchmark for tube amplification. Featuring a cool, 1960s retro design, the C22 vacuum tube preamp has been updated to modern standards to deliver a performance on par with any other McIntosh preamp. Electromagnetic input switching provides reliable, noiseless and distortion free operation. Low distortion levels of all types are less than 0.08%, allowing music to be presented with total transparency and accuracy. A total of 10 inputs include 2 balanced and 6 unbalanced along with Moving Coil and Moving Magnet phono input sections with selectable resistance and capacitive loading. Outputs are comprised of 1 set of balanced and 3 sets of unbalanced connections. Bass and Treble tone controls with bypass feature allow you to listen to your favorite songs at your preferred tonal balance. Power control outputs will turn a complete McIntosh system on or off using the front panel or remote control. With retro looks and timeless McIntosh design cues, the MC75 and C22 seamlessly blend in with contemporary McIntosh components to create one cohesive system. Both are must haves for any music lover with a fondness for nostalgic hi-fi.